This statistic represents major countries at the end of year 2017, by cumulative solar PV capacity. China's cumulative solar PV (photovoltaic) capacity reached 131.1 gigawatts at the end of 2017. With the assistance of politically-driven subsidies, the solar photovoltaic (PV) sector continues to attract investors, with investment volumes that eclipse the deals made in other markets, including the wind power and biomass energy sectors. Although the electricity derived from solar sources is much less reliable than power from nuclear fission or coal combustion, solar power has become a force in the energy market. Global cumulative installed solar PV capacity amounted to around 306.5 gigawatts in 2016, up from less than 2.6 gigawatts in 2003. 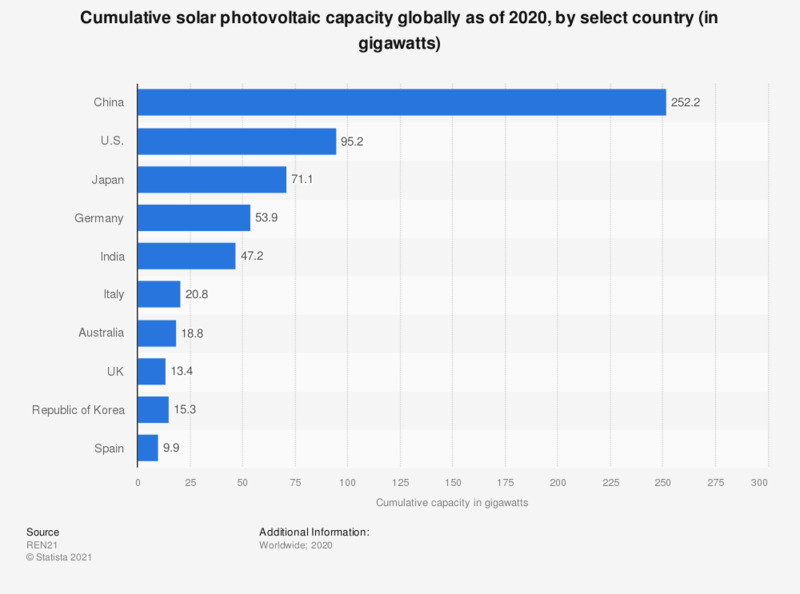 China, Japan, Germany and the United States are the most important markets for solar photovoltaic installations. The process to convert solar radiation into direct current electricity requires the use of inverters and solar photovoltaic modules. Such modules consist of a number of solar cells which are usually made from semiconductor materials such as silicon. The most widely used materials to produce solar cells include multicrystalline (also called polycrystalline) silicon or monocrystalline (also called single-crystal) silicon. As a result of policy instruments such as punitive tariffs, subsidies and tax cuts, the prices of solar modules began to fall in 2002 and its decline is expected to continue into the future as PV technology advances. While production of solar cells is increasingly shifting towards Asian markets, lower costs will likely drive innovation in the field of solar cell technology and make solar PV power more affordable.